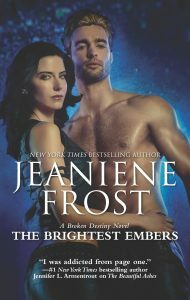 “The conclusion to Frost’s Broken Destiny trilogy is, by far, the strongest of the lot and the most fulfilling. There’s been a great deal of thought and care put into the complexity of this world, and it all comes together here in an emotional burst of action, mythology and romance. It’s saying something when the reader comes to care — really care — about the characters, even a monstrous gargoyle with a penchant for raw meat. The ending is unexpected, and is a fitting farewell to Ivy and Adrian.” Romantic Times magazine, 4 stars.